The Charly TOUCH COMBI is a comfortably soft, breathable and pliant year-round paragliding glove that is also ideally suited for cross-country skiing, biking and horseback riding in the winter. The special feature of the Charly TOUCH COMBI is that it combines the benefits of a sensitive finger glove with the superior thermal performance of a heatable mitten. 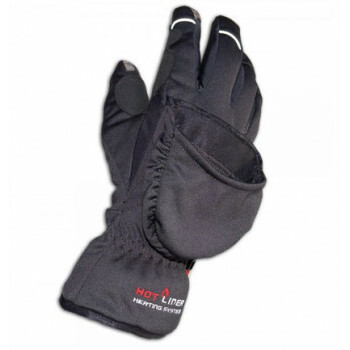 While other heated finger gloves heated with warmerpads can only warm the back of the hand or the wrist joint because of the limited way to install the warmerpads, the flexibly applicable mitten-slip of the Charly TOUCH COMBI enables a precise heating of the fingers which are always the problem with cold hands. The mitten is tucked away invisibly in the back of the hand and can be pulled out and put over the fingers when needed and thus provides an additional cold-blocker layer. For the use of the glove at particularly low temperatures, the coating is equipped with two bags at the upper side of the fingers and the lower side of the fingers, which can be fitted separately or together with heating packs if required. Also with the integrated pads, the control handles can be comfortably encompassed. If the mitten is not needed for a short time, it can be fixed with velcro at the back of the hand and is not a problem when using the finger gloves. Thanks to the smart mix of materials and the supple fit, the Charly TOUCH COMBI is very convenient. Flight instruments can be operated precisely and also the use of smartphones with touchscreens works perfectly, thanks to the Charly TOUCH COMBI's conductive leather at the index and thumb. 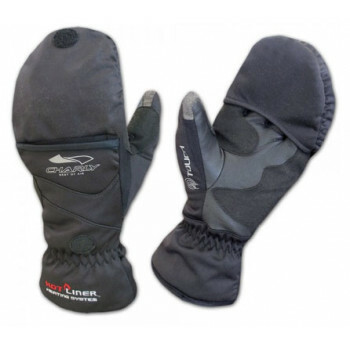 The key feature is the heating possibility of the fingers, due to the integrated mitten which is invisibly hidden at the back of the hand; if required, it can be pulled out and put over the fingers. 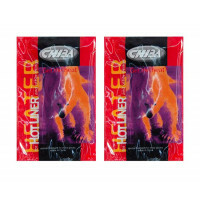 It is equipped with special bags for the heat packs both at the upper side and under side of the fingers, when wearing the gloves at freezing temperatures. If the mitten is not needed for a short time, it can be fixed with velcro at the back of the hand, and does not bother you when using it as finger glove. Soft PrimaLoft® insulation and breathable windblocker softshell material in the upperhand provide warm and dry hands, high-quality goat nappa leather in the palm improves the grip and protects against sweat. Extra leather reinforcements on the palm, the sides, and between the little finger and the ring finger reduce abrasion during paragliding, e.g. when wrapping the lines. Elasticated inserts and preformed fingers for the easy grasping of paraglider brake handles, ski pole grips, bike handlebars or reins. Heb je een vraag over Charly TOUCH COMBI, 2-in-1 fingered gloves?